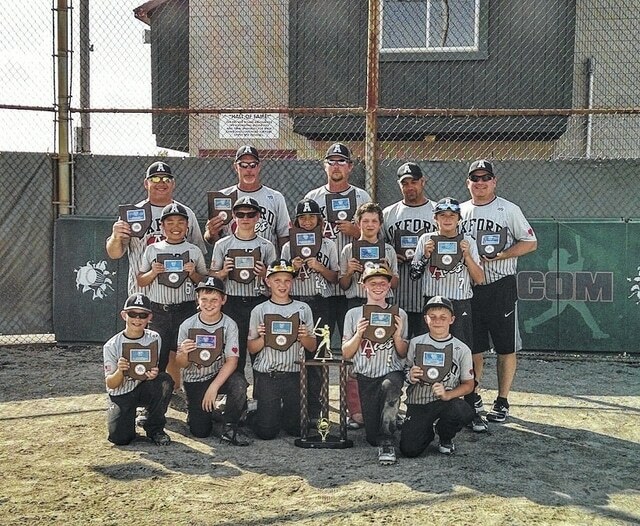 The Oxford Township Aces U11 select baseball team represented Delaware County quite well over the weekend, finishing third in the 60-team Nations State of Ohio Baseball Tournament in Bowling Green. Oxford began pool play in Group C, finishing 2-1 to qualify for bracket play as the 21st seed. The Aces lost to eighth-seeded Marysville 5-4 in the semifinal, but bounced back with a 12-10 win over the third-seeded Mid-Ohio Bullets in the third-place game. Team members, pictured with their plaques after the showcase, include Mike Choe, Cad Crisman, Landon DeWitt, Dalton Dodds, Jack Huston, Blake Jodry, Hunter Jones, Isaah Marstiller, Noah Tubaugh and Nolan Webb. Ron Marstiller served as the head coach.